Multimedia artist Michal Rovner has been the subject of over forty solo exhibitions, including shows at the Art Institute of Chicago and Whitney Museum of American Art. 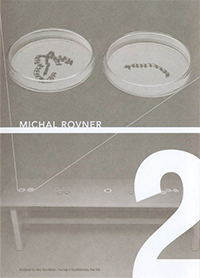 Rovner's work was also featured at the Israeli Pavilion at the 2003 Venice Biennial where it won wide acclaim. Her large body of work includes photography, video and film, as well as works on paper and canvas. The artist began her career as a photographer and the interactions between video and photography are evident in her work. Combining an array of different materials and experimenting with new media and techniques, Rovner challenges traditional boundaries of artmaking. Work in the exhibition is courtesy of PaceWildenstein.